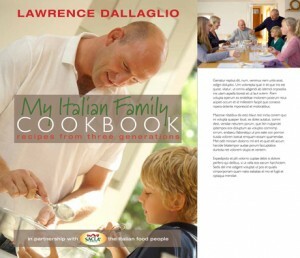 Description:- Sacla’ have teamed up with rugby legend Lawrence Dallaglio to produce a fabulous new family cookbook. All the dishes are full of goodness, easy to prepare and use the very best ingredients. Lawrence says “My Dad and I have always wanted to create the ultimate Italian family cookbook, sharing our passion, our love of cooking great food with fresh ingredients and of course our treasured family recipes. Sacla’ are now a part of our family, coming from Piedmont in Italy as we do, where they still make all their delicious products including our range, Dallaglio by Sacla’ pasta sauces. My Italian Family Cookbook combines the best ingredients with simple, wholesome family recipes and celebrates the joy of cooking and sharing food as a family. Why not try this delicious recipe, just one of more than a hundred tasty treats in this beautiful book. Review:- I was really excited to review this book, not only is it from my amazing cybermummy sponsors Sacla` but it’s an Italian Cookbook, my favourite type of food. I have to admit I wasn’t all the familiar with Lawrence Dalaglio, I’m not a rugby fan and if I’m honest it was my hubby who told me he was a rugby player but I’ve done some investigating and he seems like a decent guy and a good cook. Not just him but three generations of his family. There are so many family, personal touches in this book it’s amazing. I’ve read this book so many times and drooled over the pictures. You have to see these to believe them, they look delicious. 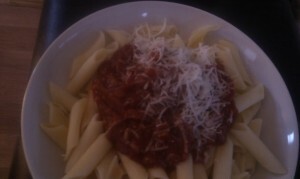 I’ve made one of the pasta dishes as you see above. Not a bad effort if I don’t say so myself. There are loads of fantastic recipes in here from quick weekday meals to fancy candlelight dinner for two dinners. The food is made with the best ingredients and are designed for family life, which is perfect for my little family. The desserts section has to be my favourite, I’ve not made any yet but I will be soon, very soon. So watch this space. I would highly recommend this cookbook to everyone, there is something in there for all, especially Italian food lovers like me. There is a chance to win the cookbook on Sacla`’s website here, where you can also find further information on the Sacla` range. Don’t forget to like their facebook page for recipe ideas and tips here. Disclaimer:- I was sent this cookbook in exchange for an honest review, which I have given above.